On Tuesday, my friend Laura and I went to the Gordon Museum of Pathology. It’s not open to the public, only medical students and a few others are allowed to visit. Fortunately for us, staff members of Guy’s & St. Thomas’ are included in those ‘few others’ and I cheekily rang the curator Bill Edwards a few weeks ago to ask about a visit. He kindly obliged and it was arranged for the 12th September. I geeked out yet again, because that’s what I do. The Gordon Museum of Pathology was opened in 1905 in the grounds of King’s College on the Guy’s campus. It is currently the largest medical museum in the country and the largest pathology museum in the world. That’s a fairly awesome thing to have the freedom to explore and I’m amazed more people don’t jump at the chance to have a nose around. Laura and I scoffed when the curator at the front desk said they were open until a quarter to nine when we arrived at half past four, until we saw the size of the whole museum. We had started off looking at every single item and made it round about a sixth of the museum in an hour. I take back my scoff, we could have spent an entire day in that place. It boasts some very impressive items which are of huge significance to the medical profession. It has items used by Thomas Hodgkin, Thomas Addison and Richard Bright to define the diseases names after them. In one corner of the museum is the mummified body of Alan Billis, a taxi driver mummified for a Channel 4 documentary and that was moved there from the University of Sheffield in 2012. This floor also contains the wax models created by Joseph Towne in the 19th Century which are still used today for study and are, simply, incredible. Alongside these, there are detailed paintings of people with tumours by Lum Qua and what seems like thousands upon thousands of pathological and surgical specimens in jars and pots arranged into either body parts or circumstances on the other floors. I very much feel that the previous 135 words do not do the museum justice, so make sure you go to the museum website and the Wikipedia page to check it out further. For the purpose of this blog post I’d like to discuss the five things I liked most about this museum, either items in it or features. I’d also like to mention that while I think it’s unfortunate that the museum is not open to the public, I entirely understand the laws and regulations around why this is the case and why it is an incredibly sensitive topic. I will, at some point, write an article about this once I get my head around it myself! For now, five things I thought were either fascinating or awesome and I would like to share that aren’t the obvious items I’ve already described above. 1. Suicide by circular saw – there is a whole section on suicide and self-inflicted wounds, and in this section is the top part of a skull with one deep, straight groove and one shallower but similar groove. These wounds were damage by a circular saw and I found myself staring at this skull for a long time. I’ve tried to type why I find this so fascinating, and I can’t really put it into words! 2. Poisons – There is a whole shelving unit of examples of poisoning, the damage to stomachs and internal organs created by the different poisons. I think this is interesting because we are familiar with the movie style gurgling and froth that comes with poisoning but I’d not really thought about the internal damage that causes that beforehand. Maybe that says more about me than anything else. 3. Joseph Towne wax torsos – There are several torsos or upper body models made by Joseph Towne that really only don’t look real to me because they’re not floating in liquid like all the other specimens. The thing I found most impressive, other than how real they look, is the effort that went into making a wax wooden block for the head to rest on. It looks like real wood and it blows my mind why you wouldn’t just use wood. Typing that I’m wondering if he thought about the wood maybe being compromised over time and then I start thinking about if he knew his models would be around for hundreds of years. 4. Tattooed skin – There’s two small boxes on display with tattoos in them, one is older than the other and has some pretty designs that I could imagine on a sailor or something. The other is a smaller design which is not as old and was removed from someone who didn’t want it anymore. I kind of like to idea of my tattoos being in a museum in a jar after I’ve died but then part of me thinks the beauty of tattoos is that they aren’t a forever art. You carry them around with you and then once you’re gone so are they. 5. Animals – Laura and I had been wandering around for a good two hours (we had the whole museum to ourselves for most of our visit, other than the curators wandering here and there and opening windows making the whole place very chilly!) and we saw a door that went into a little corridor and then to another room. It was not a part of the main museum but a separate offshoot with a stairwell corridor containing some large cabinets with animal skulls and some pretty wooden carvings at the top of some stairs going down. We wandered through (though not sure we we supposed to) and entered a large room filled to the brim with animal skeletons and taxidermy subjects. This is the Life Sciences Museum. It’s wonderful and unexpected, and we loved it. If you have any questions about the museum or the items above just leave a comment. 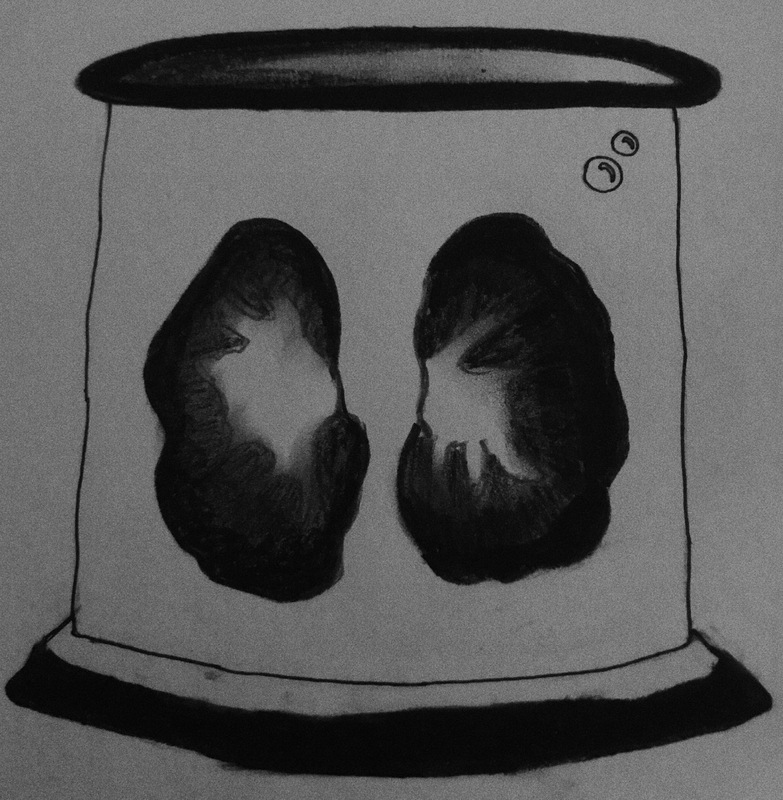 I hope you’ve enjoyed this post and my quick, ten minute sketch of some kidneys in a jar!